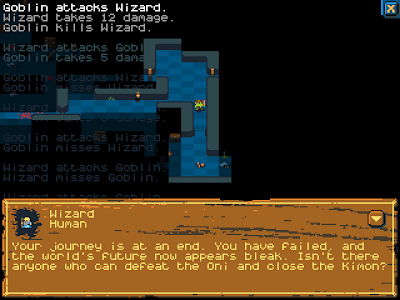 The game can be driven entirely with the mouse – which is a nice streamlined way of doing things (or utter heresy, depending on how pure you like your rogue-likes), and hovering the mouse over the stats bar gives helpful explanations. All well and good, but with clicking on an adjacent square to move, a foe to attack, or on yourself to skip a turn it can be very easy to misplace your clicks, especially if a slightly zoomed out view is adopted. But lets put this down to my lack of mouse skill, rather than a problem with the game per se. On to the meat and veg of the game. 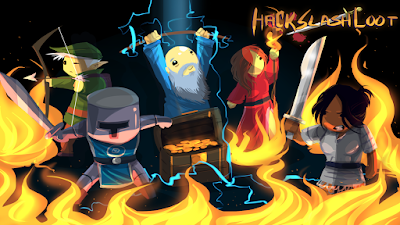 Aside from loot to loot and enemies to slay, what should good all dungeon crawlers have? A. Character classes – well yes, HSL has classes, oodles of 'em (30+), but all but three of them are initially locked. And how, you may ask, do you unlock them? By failing in the game. That's an unusual mechanic, and I can't decide if it is a stupid design choice or a stroke of genius. If you die a lot, you unlock better characters. 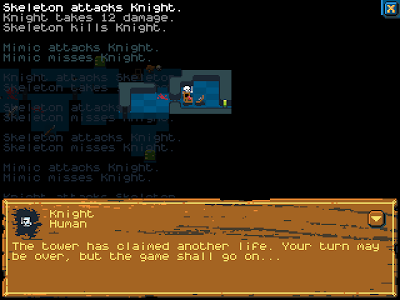 On some level this makes sense – if you're dying you need the better (and thus easier) starting characters – but the initial three are so underpowered your repeated deaths may well have dissuaded from playing the game before you unlock the better ones. Rogue-like players get used to dying, repeatedly. 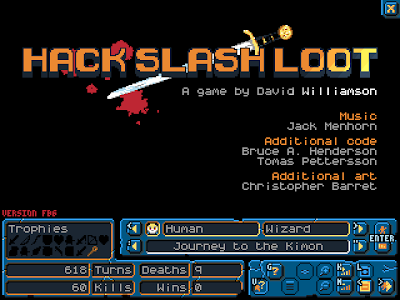 It's part of the game, but Hack Slash Loot punishes you mercilessly – and it feels like the stats are stacked against you from the outset. Quite often I didn't make it from the first room, having started in a closed chamber with an enemy that I couldn't defeat. This overwhelming feeling of futility is exacerbated by non-regenerating health and very few ways of replenishing it (aside of some very uncommon random pick-ups). Assuming you do happen to defeat the first few enemies encountered, there are numerous quests to take on – and perhaps it is a case of choosing the right hero for the right dungeon – but I couldn't shake the feeling of relying on luck rather than any skill on my part to make any progress. Character development – through the picking up of weapons/armour - is very light, and encounters with each enemy become exchanges of blows and feel like rolling dice with health being slowly worn away whilst waiting to roll a double six to win, or a double one to lose. At some point the desire to start again, and die, with no particular likelihood of progressing any further than the last attempt wore on this player's patience and the game was exited – although something did make me continually return to it, perhaps just to see if I was missing something, or could get a bit luckier this time. 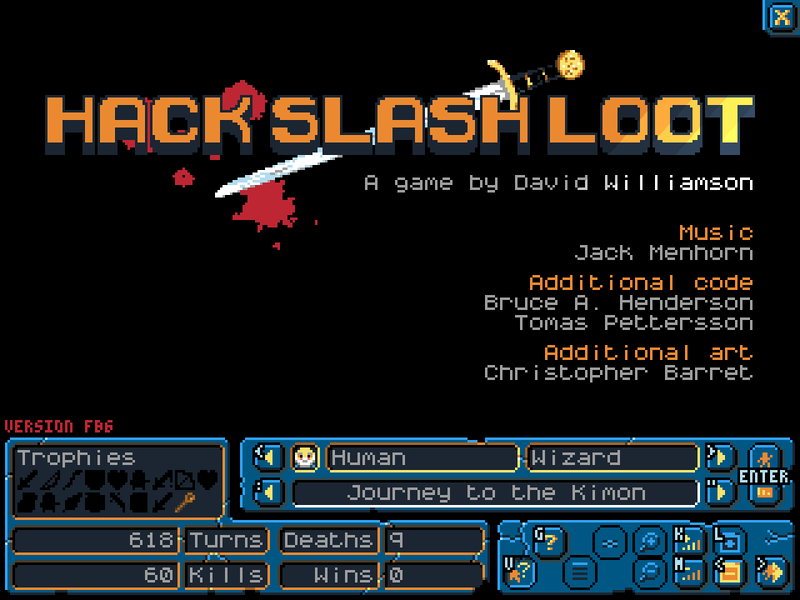 Overall the aesthetic in Hack Slash Loot is very nice, and I noticed there is some randomization-massaging going on behind the scenes (meaning you are more likely to start near items that you dropped when dying on a previous game) but I would be reluctant to recommend this game for $10, although the forums on his website suggest that author David Williamson is listening to user feedback and making changes to the game that may improve it. For now the free demo gives a very good flavour of the game, so potential customers can see if they'd like it – but I'd also suggest trying the excellent Cursed Loot (XBLA) and Desktop Dungeons (PC/Mac) for other (possibly more enjoyable) dungeon crawling outings. Download the demo/buy the game here (from the David Williamson's website). I'm hoping that the creator brings in some very welcome updates some time soon.